Do you hear doves where you live? Every morning and evening I hear doves at our home. Their call is beautiful and peaceful. When a mourning dove landed on my birdbath one morning, I managed a quick photo as she glanced my way. Good Morning, 8×8 original watercolor on gesso-covered watercolor paper. $50. Matted to fit into a 12×12 frame. The texture in the sky has been created by a sweeping movement into the wet gesso using the end of a paint brush. 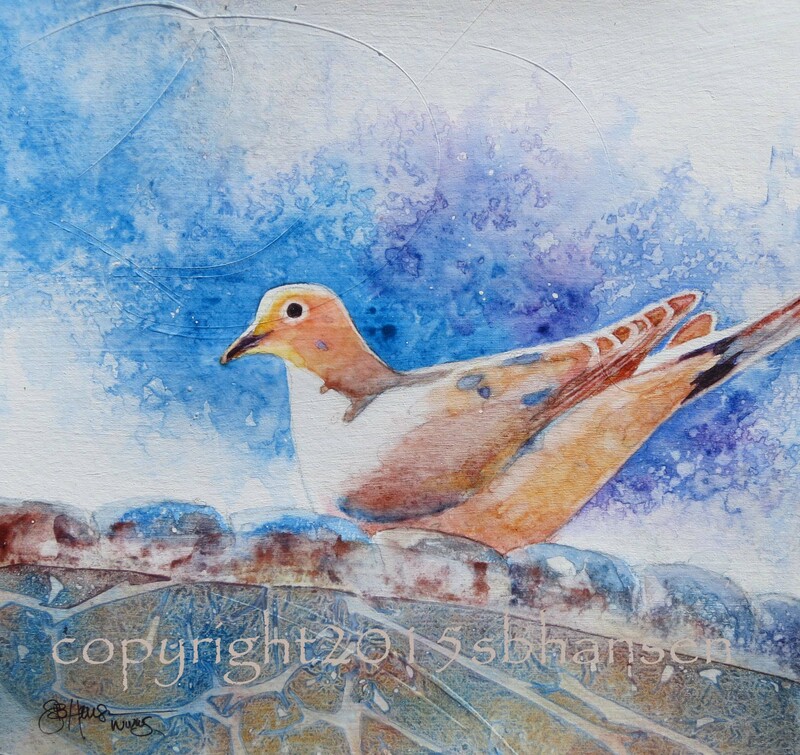 After the gesso dried, I drew the dove and bird bath onto the paper. I then I painted cobalt and purple watercolor into the background, and sprayed lightly with clear water. The bird bath texture I created by laying plastic wrap into wet watercolor paint and allowing it to dry. I love the morning light on this dove. When I painted her, I kept her feathers very smooth and pure, with little texture, as they have a perfect, almost ceramic look to them. When combined with the textured background, the smoothness is accentuated. She is is beautiful. Hope you think so, too. Happy Thursday everyone!